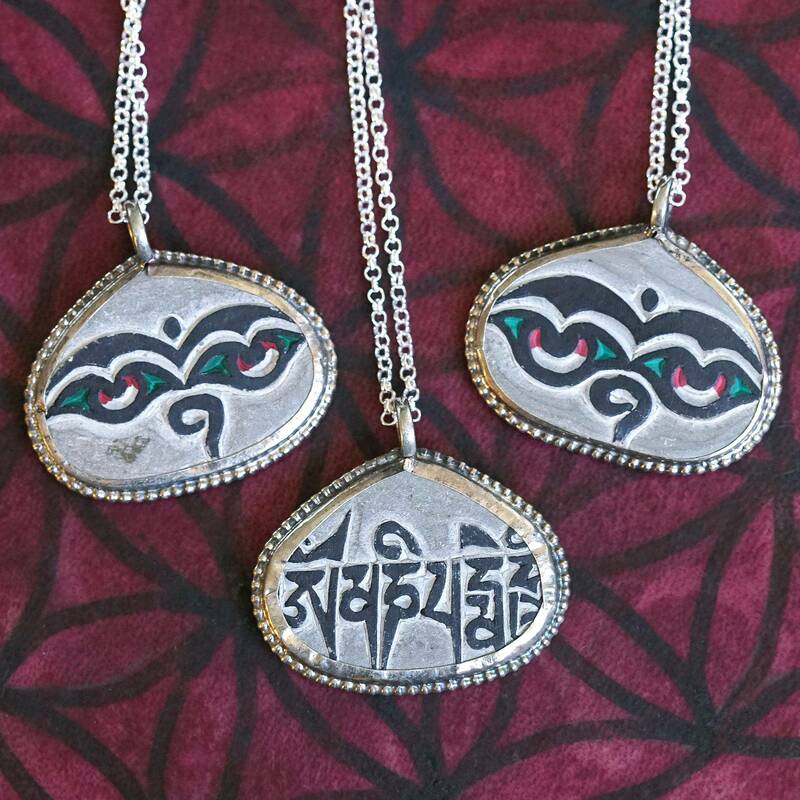 Featuring the compassionate eyes of the Buddha, these carved mani stone prayer pendants are a unique and beautiful reminder of both the supremacy and mystery of this ancient, enlightened deity. Carving in beautiful, ornate detail, the Nepalese artisans who crafted these mani stone talismans featured Buddha’s eyes on one side, and on the other, the sacred mantra “Om mani padme hum,” written in ornate Sanskrit. The carving of mani stones is a devotional and intentional act of sādhanā, which is an ego transcending spiritual practice during which the devotee accomplishes an intentional action. Then the stones are worn or offered as a form of devotional cintamani, which is a wish fulfilling jewel in both Hindu and Buddhist traditions. They can be found throughout Nepal and Tibet. Buddha is the quintessence of enlightenment. As you know, he represents your utmost nonphysical awakening – the ability to reach a state of Nirvana. He calls us to send out love, compassion, and light, and to exist in a state of mindfulness. Buddha is Zen, peace, stillness, and quiet from deep within. And throughout Eastern traditions, we find bodhisattvas, which are the embodiments of the various enlightened qualities of Buddha; they are the warriors of peace and compassion. These pendants invoke your inner bodhisattva. A mani stone is a stone plate, rock, or pebble engraved with the six syllable mantra of Avalokiteshvara, the bodhisattva who embodies the compassion of all Buddhas. It is widely told that Avalokiteshvara set out to free all sentient beings from the wheel of samsāra, or suffering. And Tara, in all forms, is a manifestation of the outpouring of Avalokiteshvara’s compassion for all sentient beings. You can wear one of these mani stone prayer pendants to call in the energies of peace, love, and compassion. Let it serve it as your reminder, or hold it in meditation, and if you feel called to, chant its sacred mantra. 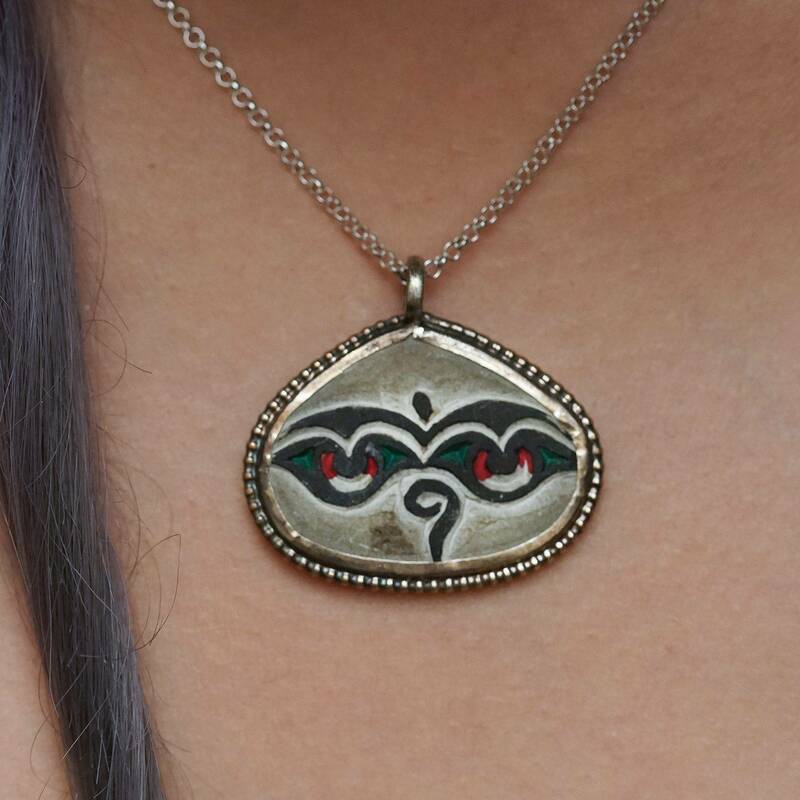 This listing is for one mani stone pendant from those you see photographed, about 1″ in size, which will come on a black cord (if you prefer the silvery chain in the photo please specify this in your notes). Yours will arrive beautifully wrapped and ready to serve you in peace, love, and compassion.